The phone rings and we answer it to find an exasperated TME friend on the other end. Lara, who has been a friend for years, was at her wits end with her Rosacea. 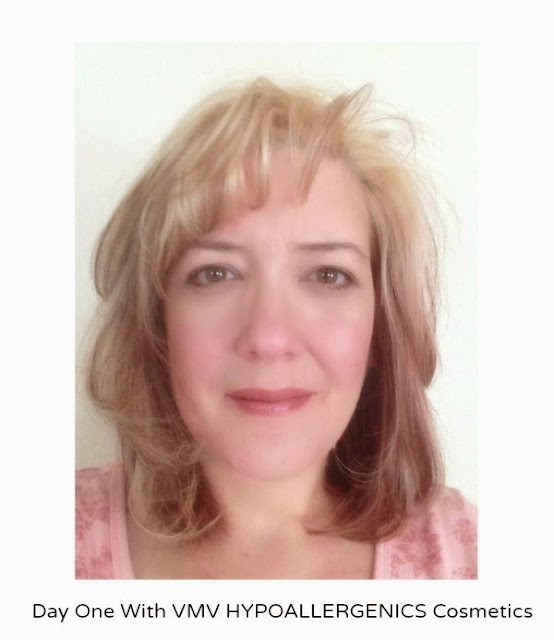 Lara has tried just about everything to get her Rosacea under control and she is far from alone in this endeavor. 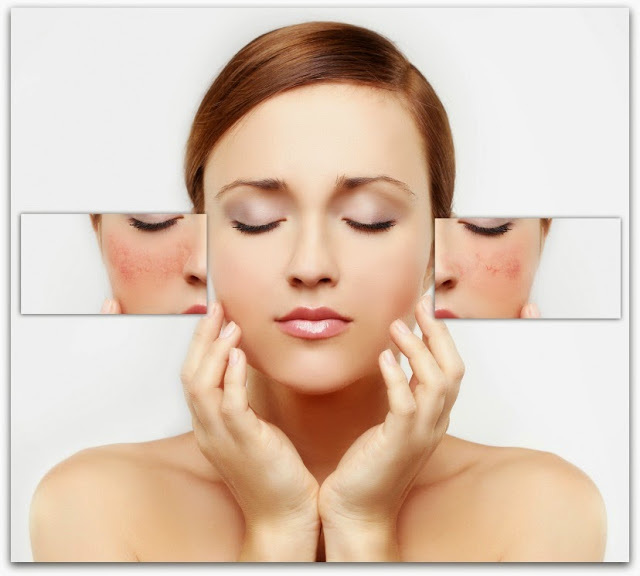 With over 40 million people, worldwide, affected by Rosacea it is a fairly common skin issue. We’re a pretty tight-knit group and that closeness extends to our readers. So, when one of you contacts us we leap into action to help solve the problem. The TME Team did an extensive search for products that could help Lara’s Rosacea, as well as listening to what she’d already tried... the list of products was mind-boggling. Coincidentally, a member of the team was doing a little (a ton) of online shopping and happened to see VMV Hypoallergenics. It wasn’t a brand that we’d heard of before and it wasn’t one that Lara had either. First we did our research on the brand and then we reached out to VMV Hypoallergenics for help! The first item of note is that all of VMV Hypoallergenics products were beautifully packaged in an environmentally friendly fashion. VMV Hypoallergenics products are extensively tested (on humans NOT animals) and free of the 76 most commonly known allergens. And you don’t have to have a skin issue to use them. The brand’s skincare line is recommended for all skin types and it carries a myriad of on-trend cosmetics. But, let’s get to Lara’s experience. Day One – "The Deeply Soothing Cleansing Cream felt very rich, cleansed my skin and didn’t leave it feeling tight or dry. Daily Therapy Moisturizer felt light, absorbed quickly into my skin and didn’t leave a greasy feel. The Red Better Flare-Up Balm also absorbed quickly and wasn't greasy. I did use the Red Better Spot Corrector on all the red areas of my face. A little goes a long way, and at first it felt VERY greasy. I was concerned that it would be just too greasy, but within a minute or two it absorbed and left my face just feeling soft. 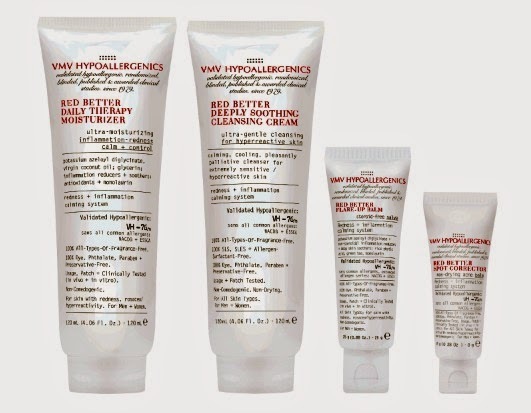 All products have no fragrance, and none made my skin feel tight, irritated, or 'angry'. I did not notice any immediate reduction of the red areas of my face, but this is only Day One and I will be continuing the regimen twice daily to see if that changes." Day Four - "I started noticing a difference in how my skin felt and the redness." Day Seven - "I could definitely see that I was less red and my skin felt nicer. There is no unpleasant odor to any of the products, and they were very easy to use and soothing to the skin. By the end of the first week I could definitely see an improvement in both redness and texture." "When I first saw the Illuminants Brilliant Finish 25 Powder Foundation I thought it was a cream, but it is actually a nice light compressed powder that completely covered the redness, much to my surprise. It felt light, but gave full coverage. The Antioxidant 2-Way Powder Foundation also felt very light and has a slight pearlescence to it and a little goes a long way. The Skin Bloom Blush that I received was the shade "Luminous," which is a white pearlescent powder that looks very nice. I think I would save that for evening use." Are you going to see instant results during a Rosacea flare-up? No. However, four days in our model Lara could see and feel the difference in her skin. 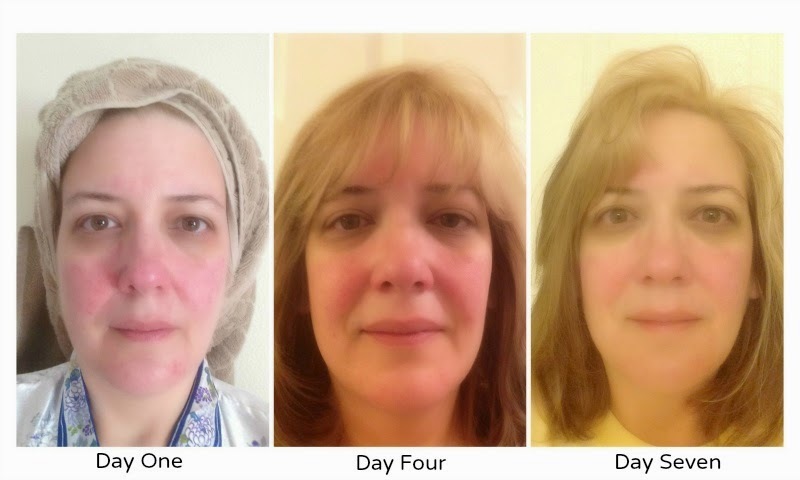 As for VMV Hypoallergenics cosmetics, Lara experienced superior coverage during a high level Rosacea flare-up! VMV Hypoallergenics are available online and select retail locations.